Brittany is a part of France that is easy to reach. Travellers from the British Isles who don't want to drive can fly to a choice of destinations in or near Brittany; but if you want to travel to Brittany by car, there are ferry crossings that will take you straight to Brittany, to minimise driving once you disembark. The alternative solution is to take a short Channel crossing from Dover, then follow France's northern coastal motorway via Boulogne and le Havre. Brittany is very well served by motorways and dual carriageways. 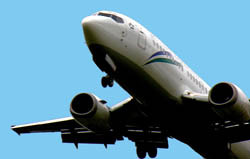 The five main Breton airports are served by direct flights from a number of UK and Irish airports. Many routes are seasonal. 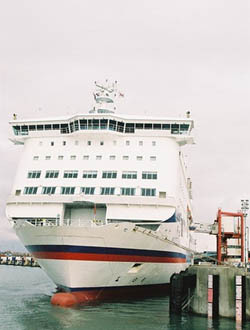 There are direct ferrry services from the UK to Brittany, operated by Brittany Ferries but also by Condor Ferries . There are also services to Normandy. Brittany is served directly all year round by ferry services from Plymouth. For travellers coming from London or the south east of England, it may be quicker, though a longer drive, to take one of the short crossings from Dover, such as P&O Ferries and drive the rest. Click here to check ferry prices and book online. From the UK, Brittany can be reached by train in a number of ways. There is no shuttle bus connection from the station at Plymouth to the ferry port, but there are taxis. To reach Brittany directly by train from the UK, the easiest way is to take the Eurostar to Paris and then go to Paris Gare Montparnasse for a direct TGV high-speed train to Rennes and stations beyond. 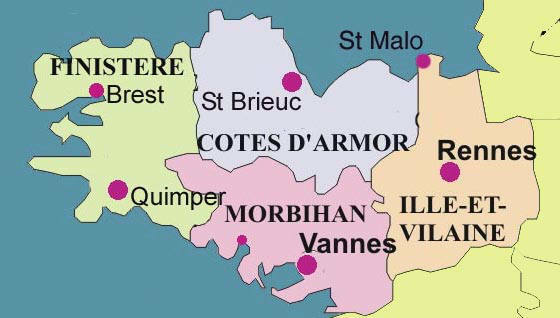 Direct TGV services operate from Paris to Brest and Quimper. Click here to check train timetables and fares and book tickets from UK to France or within France using Trainline.eu. Brittany accommodation tends to be quickly booked up for the peak season, notably between mid July and midAugust, so booking early is a wise move; but unlike parts of the south of France, the holiday season falls off quite sharply at the start of September, so there are plenty of hotel rooms and holiday homes in Brittany available for bookings late in the season. However, if it is sun and the seaside that you are after, as well as escaping from the crowds, it is probably best to take your holiday in June or early July when the days are longest, rather than at the start of Autumn. Compare ferry prices to Brittany and book online. Copyright Gitelink.com 2003 - 2019.